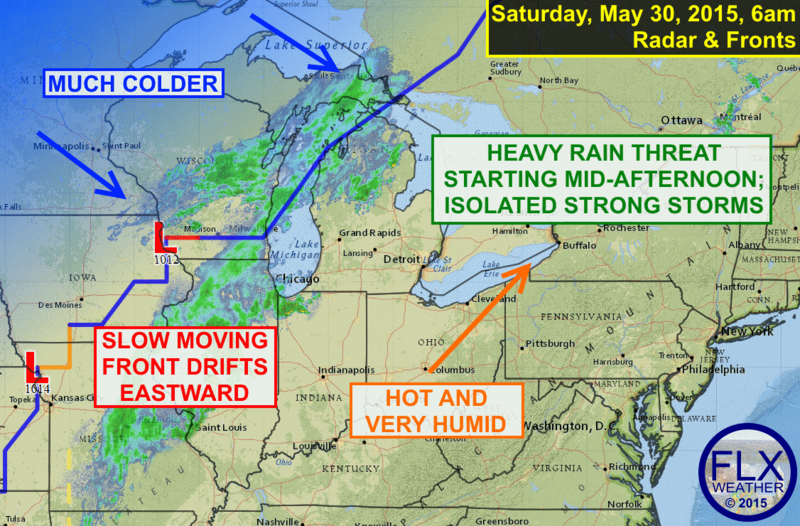 A hot and very humid day will turn stormy by mid-afternoon across the Finger Lakes. 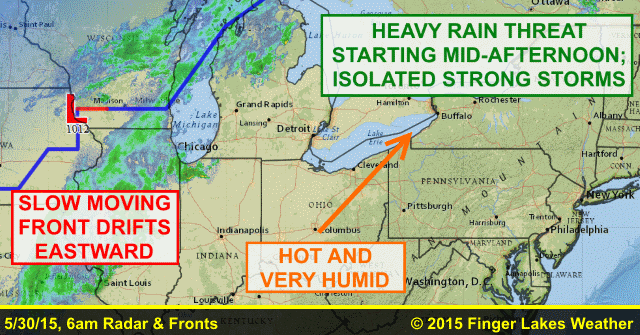 Heavy rain is the main threat, but some locally strong storms are possible, too. The stage is set for a very hot, humid first part of Saturday followed by the threat for excessive rain and a few strong storms later this afternoon. A slow moving cold front will push southeast towards the region later today. Out ahead of the front, at least some breaks in the clouds are likely, if not periods of full out sunshine. Temperatures will quickly rise into the mid and upper 80s by the early afternoon in response to a southerly wind ahead of the front and the sunshine. Dewpoints will rise into the upper 60s to near 70º, making it feel even hotter and oppressively muggy. The heat index will be 90º or higher for a good part of the region. While conditions at the surface will seem ripe for strong thunderstorms, conditions aloft will be much less favorable. Temperatures will only slowly decrease with height and the winds will remain steady in both speed and direction throughout the lower and middle parts of the atmosphere. For severe thunderstorms, quickly dropping temperatures and changing winds are needed between the surface and mid-levels of the atmosphere. With these key ingredients lacking, the severe threat should be limited to isolated, short lived strong storms. These storms may still be capable of producing some locally severe conditions, but they should be short lived and few and far between. Strong winds are the main threat from any storms that become strong. While strong storms may be hard to come by, heavy rain will not. By the mid afternoon- 3pm or so- rain and thunder will start to develop and will quickly become widespread. The same areas may get hit by multiple rounds of thunderstorms with very heavy rain. 6-Hour flash flood guidance suggests it will take 2.5″-3″ of rain in a six hour period to cause flash flooding. The 1-hour guidance is closer to 1.75″-2″. These are fairly high numbers, so the region can take a good soaking of rain fairly quickly, but I would not be surprised if these amounts are exceeded on a localized, small scale basis somewhere in our region. Additional rain is possible overnight and into Sunday and even Monday. However, there are a lot of uncertainties with this rain due to the slow moving nature of the front, which may even stall or move backwards over the next couple of days after passing through tonight. To recap: The severe threat is minor today. one or two storms will probably reach severe levels, but on a small scale and for only a short time. Very heavy rain is a much larger concern, though most of the region will probably be able to handle the rain without too many serious consequences. Still, it is possible that conditions will converge to create a dangerous situation where you are, so use caution and due prudence this afternoon and evening, just in case.